Here is a solution how to disable Filebot autoextract. While filebot autoextract is enabled it will automaticaly extract files from zip, multi-volume rar and 7zip archives as well as ISO images. After you change the code make sure to press CTRL + O to save changes and CTRL+ X to leave . After you change the code make sure to press CTRL + O and to save changes and CTRL+ X to leave . There is a way to disable Filebot autoextract in Deluge or rTorrent via Pydio. Just follow this steps. Log in Pydio with your Username and Password. First we need to change the settings so we can see Hidden files. When you enter your Box , in top right corner click on your username and choose Settings. 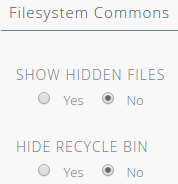 List down until you see Filesistem Common, under Show Hidden files then choose Yes. Now we can see hidden files. 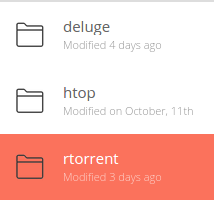 Here you can see folders Deluge and rTorrent. 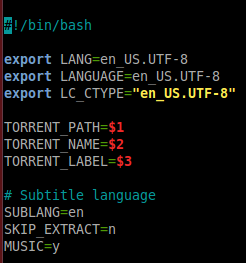 Open the folder rTorrent and find a file called filebot. 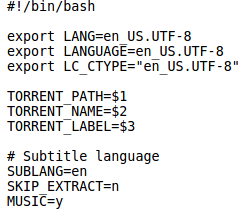 Open the folder Deluge and find a file called filebot.py.